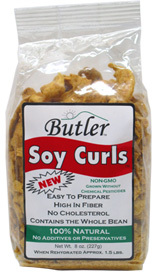 An interesting new meat substitute, Soy Curls make an excellent addition to soups, casseroles, potatoes, rice, stir-fries, noodles, spaghetti sauce, chili, pizza toppings, salads, curries, enchiladas and more. With 10g of non-GMO soy protein per serving as well as 3 of fiber, Soy Curls add a hearty texture to your favorite dishes. Just soak for 10 minutes in warm water, season them to taste and you’ve got a tasty and healthy complement for your next meal. 8 oz. (227g) package makes approximately 1.5 lbs. of meat substitute when rehydrated. $4.89 per package. From Anonymous of Belfast, Maine on 3/17/2019 . From Lauren Andalora of Salt Lake City, Utah on 11/4/2017 . accept marinade well, great for soup, jerky, and more. need a 5 pound bag! From Anonymous of Concord , Massachusetts on 8/16/2017 . From Verona of Jacksonville, Florida on 9/25/2016 . We ordered these after reading other customer reviews. After the first bag was gone, we ordered six more. The texture is great, and they take on any flavor. We have made BBQ, "Chicken" salad, soup, beans, and jerky. Soy curls are a great find! From Adrienne Daniels of Columbus, Ohio on 9/4/2015 . I used these in leftover black-eyed peas and it made it an entirely different dish. Love the texture and can honestly see how these tiny soy nuggets will adapt to any flavor imaginable. Awesome!